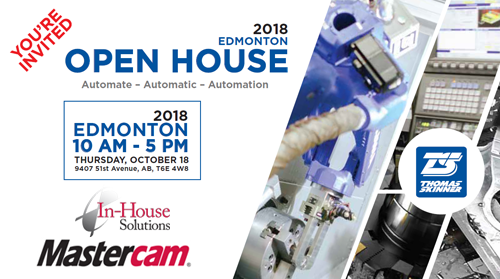 You’re Invited to the 2018 Edmonton Thomas Skinner Open House! • In-House Solutions will be there! • See demos – all day – that feature a variety of CNC technologies. • Get technical support and advise from our industry partners. • Meet the Thomas Skinner Team. • Enjoy food (11 AM – 3 PM) & refreshments. ← eMastercam Sitewide Subscription SALE!